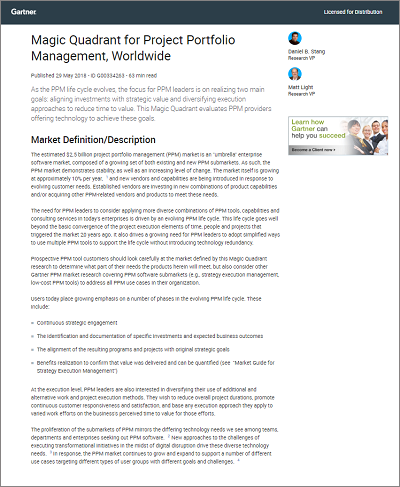 Planisware | Planisware named a leader in Gartner's 2018 "Magic Quadrant for Project Portfolio Management, Worldwide"
Planisware was a named a leader in the 2018 Gartner "Magic Quadrant for Project Portfolio Management, Worldwide." Today's organizations are focused on a PPM solution that enables them to align investments with overall strategic value and reducing time to value through diversified execution approaches. Leading PPM solution providers have responded accordingly, offering more robust suites of software products that can accommodate diverse needs. In its evaluation of the industry, Gartner states, "the PPM market continues to grow and expand to support a number of different use cases targeting different types of user groups with different goals and challenges." To develop the Magic Quadrant, analysts Daniel B. Stang and Matt Light evaluated 17 PPM providers that empower businesses to achieve these goals, based on the technology vendors' ability to executive and completeness of vision. Planisware was named a Leader. The organization now offers three differentiated solutions: Planisware for NPD and R&D; Planisware for Engineering & Project Control; and Planisware Orchestra for IT and mid-market. According to Planisware co-founder and CEO, Pierre Demonsant, "Planisware has invested a significant amount of resources to determine how we can grow our suite of solutions to best meet business needs across the entire enterprise and serve the evolving PPM market. We believe that our placement in the leaders quadrant validates our innovation strategy, the changes to our product offering, and Planisware’s overall versatility and value. Furthermore, Gartner surveyed several Planisware customers during the research process and we believe that our position in the leaders quadrant affirms their satisfaction with our services and solutions, and culture of developing strong partnerships with customers."